At times Åse’s vocals are not without recalling the soft silky tones of Susanna Wallumrød (Koloust) or the rawer textures of Wildbirds & Peacedrums’ Mariam Wallentin (Numb Street Cabaret, Chson), yet at others, she is much more reminiscent of Sidsel Endresen, not only in the slightly smoky quality of her voice, but also in her approach to words and non-words, and in her use of extremely syncopated buccal sounds. Her range is quite extraordinary, as she reaches from new tonalities for almost each of the nine tracks collected here, and works around them, fleshing them out, by adding further variations and touches. At its softest, used on songs which, whilst far from being straightforward, show some strong musical qualities, Åse’s voice is nuanced and dreamy. On Koloust for instance, she alternates between whispered spoken words, processed loops and a delicate melodic structure as Strønen softly brushes toms and bells, as if he was desperately trying to be as inconspicuous as possible. Mostly which follows works along similar lines, but Åse’s murmurs and breath are layered over a much more metallic version of themselves, contrasting with Strønen’s more upfront and substantial drumming sequence. On the disconcerting Raised, Rave, the comparison with Sidsel Endresen is almost unavoidable, as Åse echoes Strønen’s hectic percussions with intricate mouth noises which she further distorts by collating them into tight chaotic loops or by distressing their texture. On Chson or Grains earlier, Endresen’s influence is also felt, but it is less clear tangible, manifesting itself mostly when Åse hits either the higher or lower registers. Musically, Voxpheria is somewhat desolate and minimal at best. There is often little more than a few percussions and tiny electronics to support Åse’s vocal inputs, and even when the arrangements are briefly given more prominence, the focus is still essentially on the voice. Opening piece Numb Street Cabaret stems from a series of intricate sounds and noises over which Åse’s processed sung vocals and spoken words hang inquisitively. 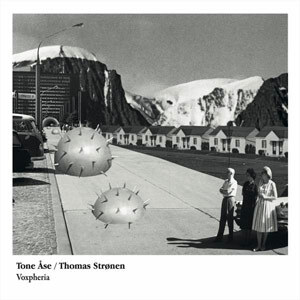 Strønen is in particularly introspective mood on Koloust, using only a small selection of toms, pans and bells to match his partner’s equally reflective state. The meditative mood becomes darker, more unsettling later on Grains. Strønen’s percussive contribution is reduced to just a few touches as sombre electronic textures slowly spread. On Helialoo, the pair take their experimentation to a different level, starting with a fairly linear drum patterns over which Åse develops a fairly simple melody, but in its last minute, the piece is progressively entirely covered with distorted noises and end up collapsing under its own weight. With Voxpheria, Tone Åse and Thomas Strønen have created quite an incredible piece of work. In turn spellbinding or disconcerting, accessible or challenging, it brings two incredibly talented and individual musicians. The result is, quite simply, breathtaking.